Exhibition Of Paintings By K Jayakumar is an event that took place between 19-Feb-2007 and 03-Mar-2007 in Hyderabad. Paintings made by Jayakumar by looking at himself from secret vantage positions, and eventually discovering that he is floating. Listen, we are just quoting. An exhibition of abstract paintings titled Selfspy, by K Jayakumar, is being held at the Kalahita Art Foundation, Nagarjuna Hills, from 18th February to 3rd March. 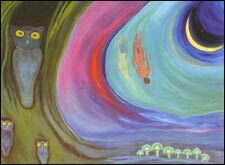 This series has 43 imaginative and abstract paintings, all done on the medium of oil paints on canvas. Jayakumar, a self-taught artist born in Kerala in 1952, is also a poet, author and a lyric writer in Malayalam. He is a Post-Graduate in English Literature, and has translated a series of literary works of Rabindranath Tagore, Kahlil Gibran and Rumi into his state language. He's even directed a children's film and scripted some films. In Selfspy, the artist starts out with tiny, self-conscious steps to look at himself from secret vantage positions, but slowly he allows himself to go with the flow only to discover that he is actually floating. It is this freedom that catches his breath and yet brings about a serenity in the works that follow. Here the choice of colors takes a turn from the vibrant reds and tangerines to spiritual lavenders and hazy blues. The textures take on gentler tones as they meld seamlessly to create images that are starkly sensual as they are passionate. Tantrik images that hark to theyyam practices from the dark, glistening backwaters of Kerala have found their way into the canvas. Female forms nestled into silent crannies of wooden tharvads loom as shadows that make their presence felt in a myriad way. For further details, please contact the art gallery at 2335-0543. Be the first to comment on Exhibition Of Paintings By K Jayakumar! Just use the simple form below. fullhyd.com has 700,000+ monthly visits. Tell Hyderabad what you feel about Exhibition Of Paintings By K Jayakumar!